Serpent Isle inaccuracies [German|English] - Serpent Isle Nitpicks at Hacki's Ultima Page [German|English]. The Serpent Isle copy protection questions and answers are available on my copy protections document. Houston Dragon's Ultima Page has A Who's Who of Serpent Isle. It shows in detail the many characters in Serpent Isle, as well as their portraits and their role. A list of weapons and armour statistics are on the Other Codex (Internet Archive). You can find a list of lost items (taken away by the teleport storm) at Mike's RPG Center. There is also a list of merchandise with prices. Mike's RPG Center has a list of spells including the reagents they require, their prices and locations. There is also a separate page about reagents. A patch [ZIP] for general midi compatibility is on the Ultima Web Archive. The original plot of Serpent Isle, complete with cut-out parts, related to Moonshade and Mad Mage Isle has been found. "Serpent Isle cut plot... (notes)"
** Originally Bill Armintrout and I were doing the initial design on Serpent Isle. The mandate we were given by Richard and Jeff George (the producer at that time) was that it was to be about the conflict between Brittanian magic and VoDun (VooDoo) magic. And that the island was to be called Serpent Isle because it we were suppoesed to make it in the shape of the snake necklace that Richard wore (and still does, I think.) So I spent a month at the UT LIbrary checking out and reading books on VoDun as that was my side of the design. We'd been in design about three or four months when there was a "re-org." Jeff George quit and the game was given to Warren Specter to produce. We were told to essentially toss everything out and start over. I recently gave the maps and docs from the earliest part of that design to the Origin Museum. ** It was during the reset of Serpent Isle that I came up with the Order + Chaos = Balance religion that made up the base of the current Serpent Isle. I had it all on a white board in the office and was trying to explain it to Bill Armintrout. Bill refused to see it and kept saying "You can't add things that aren't numbers. This makes no sense. Things like that don't add together. " I got SOO frustrated with trying to explain it that I pulled in Brendan Seagraves and explained it to him. He saw that it made perfect sense and then he explained it to BIll.. and only then did Bill "get it" and agree to put it in the game. Prem Kirshnan and I then worked on putting it together and coming up with the final components. The Cutting Room Floor has a whole list of unused data and artwork in Serpent Isle, ranging from character portraits to unused items. There's a list of people with names, jobs, locations and notes at Mike's RPG Center. There are some Serpent Isle Pictures on the World of Ultima. Exult is the engine to use to run Ultima VII (Serpent Isle included) under virtually any modern platform. Read my review for more information. Ultima VII: Chronicles of Batlin was supposed to be a new game using the Exult engine where you play as Batlin, and it would have taken place before the Avatar came upon Serpent Isle. Ultima 7: Blackrock was a project using the Exult engine which aimed to remake The Black Gate and Serpent Isle, adding the long-forgotten Serpent Isle original plot and elaborating on elements in The Black Gate that could have been expanded further. 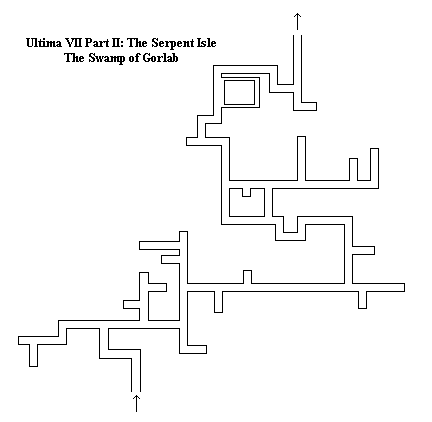 The Ophidian Alphabet can be found on the Ultima Web Archive. Gary Thompson's walkthrough for the Silver Seed can be found at Bootstrike. There's another Serpent Isle walkthrough in point form at Mike's RPG Center.